Hopelessly addicted to email, social networking, or other online distractions? Robert R. Morris and Dan McDuff created Pavlov Poke to wean themselves off Facebook and finish their dissertations. UI Inspector: You need something to monitor computer application usage. We use the Mac's UI Inspector. Processing Code: If a distracting site is visited too frequently, a Processing script produces an on-screen alert. Arduino: An Arduino is connected via USB to the computer. When a shock is triggered, the Arduino activates a relay and starts the shock circuit. If you want more info on how to build a shock circuit, check out this fine tutorial. Electrodes: Conductive metal strips are placed on the keypad. When the Arduino relay is triggered, a current is sent through the strips and through palm of your hand. Ouch!!! Wait, shocks not creepy enough for you? How about having a total stranger call you up and yell at you? UI Inspector: You need this to monitor computer application usage. Python Script: If you look at a site too frequently (e.g., Facebook), a python script automatically posts a job to Amazon's Mechanical Turk - a crowdsourcing labor market. 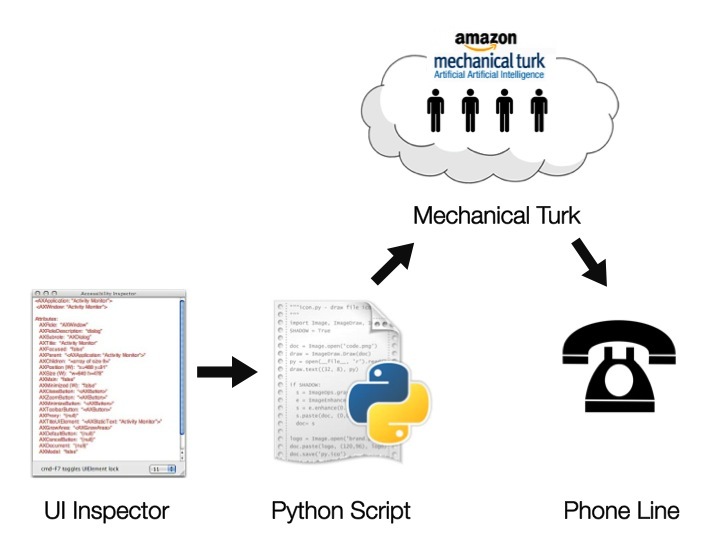 Mechanical Turk: On Mechanical Turk, a worker automatically gets recruited to call you up and yell at you.